Claire and Will’s Pre wedding shoot date fell in that gorgeous period in early June where we had stunning sunshine – remember then? I think it was called our summer… Anyway we were delighted to be heading to Frinton-on-Sea with them, which turns out to be a fantastic beach for shooting on! We’ve shot at Southwold and Wells-next-the-Sea which are also gorgeous, but Frinton-on-Sea is very flat hard sand – perfect for running and jumping around on! Now this is essentially a masterclass of a pre wedding shoot so look and learn folks. We’re not saying Claire and Will are perfect posers (as you well know this wouldn’t be what floats our boat!) it was their approach to their beach pre wedding shoot which made it perfect. They just messed about enjoying each other’s company as if we weren’t there and it was awesome. It was the best way for us to all get to know each other better, and we laughed LOTS. Turns out these two are professional-standard jumpers too! They take jumping shots wherever they travel, so not only do they have perfect timing but they have great height too! All in all this makes for a pretty epic shoot. We’re also super excited about their wedding as it will be our first at Fanhams Hall since our own wedding in December 2014. We purposefully didn’t shoot there once we’d chosen it as our venue, and we met Claire and Will less than a month before we got married. So it’s so exciting to go back with them, we’re sure it’s going to be a fab day! 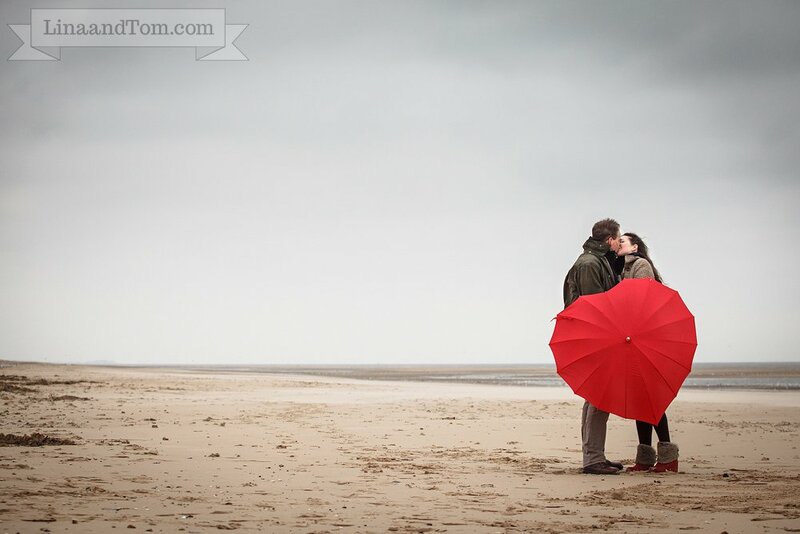 After having a little bit of fun with them on the sand, we love the drama of this kiss! Their wedding will be our first at the gorgeous Hengrave Hall in Suffolk, so we’re very excited! Being Cambridge wedding photographers we tend to do a lot of pre-wedding and engagement shoots in the city, which we love as it is beautiful, but it is also wonderful to get out of the city every now and then, and we were excited when Rachael & Nik booked us for their April 2013 Berkshire wedding and told us that the beach at Wells-next-the-Sea was special to them.